There’s a unique feeling of satisfaction and contentment that comes from eating a great bowl of ramen. Perhaps it’s the combination of savory broth and hearty noodles that make ramen such a feel-good food. Whatever it is, when the bowl is empty, life is good. Bliss-inducing ramen is easy to find in other parts of Los Angeles, such as West LA and Little Tokyo. But good ramen in the San Fernando Valley west of the 405 is a needle in a hay stack. For West-Valley-bound ramen enthusiasts, Futaba Japanese Restaurant is that needle. Futaba is a cozy establishment that’s tucked away on the second floor of a strip-mall on the northeast corner of Nordhoff Street and Reseda Boulevard in Northridge. Like many places in the Valley, Futaba doesn’t look like much on the outside, but it has it where it counts – on the inside, and in the bowl. Even though “Japanese Restaurant” is in its name, which suggests a wide array of specialties, ramen is what Futaba is really all about. The restaurant offers the usual suspects of tonkotsu (pork bone), shoyu (soy sauce), miso (fermented soy bean) and shio (salt) based broth. But the star of its lineup is chasumen, which is Futaba’s deluxe ramen with the choice of broth, and four slices of chashu (sliced pork) instead of one. 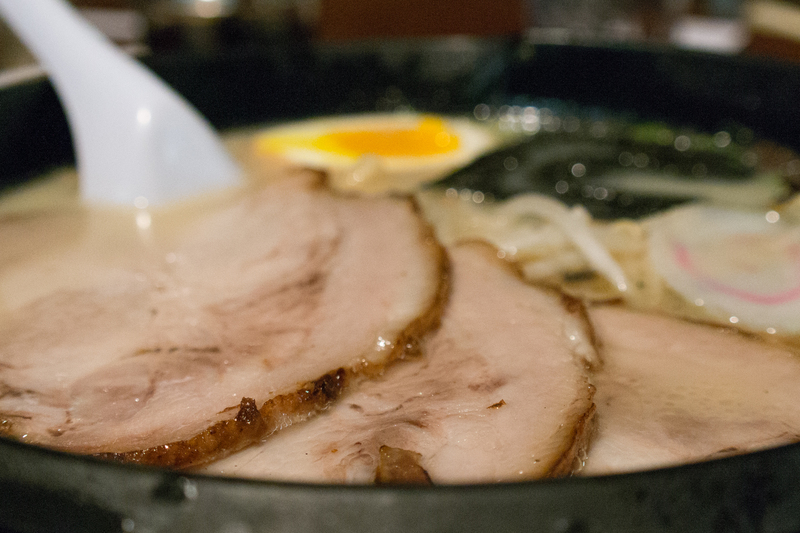 Tonkotsu broth is rich and creamy, with a deep, savory pork flavor. It’s the kind of flavor that is addicting, and leaves you wanting for more. But Futaba’s tonkotsu is not as oily, or intensely flavored as some of the bolder ramen houses in LA. Futaba doesn’t add black garlic-oil to it, either. Instead, its liquid-pork heaven speaks for itself, with a straight-forward, porky flavor. Chopped garlic and whole, soy-sauce-soaked garlic cloves are available on-the-house to add intensity to the broth. Yes, there are slices of roast bacon in Futaba’s chasumen, and they are glorious. The chasumen’s chashu is meaty and delicious. It has enough fat to add flavor and texture to the meat, but not too much to distract or overwhelm. But the best part of the chasumen’s chashu is some of its slices are from the same cut as bacon. But a great bowl of ramen wouldn’t be complete without ajitsuke tamago (flavored egg). Inferior ramen joints hard-boil their eggs, and serve them fully-cooked with chalky yolks. Futaba does it right and leaves its yolks gooey and creamy. All of Futaba’s ramen comes with half an egg, though additional eggs can be added on request. The amount of green onion, wood-ear mushroom and bamboo shoot is not customizable, but it is proportioned just right. The three distinct flavor-and-texture-adding elements do their part without overpowering any particular bite or slurp. Good ramen is tough to find in the West Valley. With its flavorful tonkotsu, delicious chashu and spot-on ajitsuke tamago, Futaba is a good choice for local ramen enthusiasts who don’t want to journey down the 405, or all the way downtown, for a ramen fix.